Welcome to Century Game Park - Established in 1837 by the Potter Family. Experience the noble presence of these ancient wild animals on one of our Farm Tours. Generations of Elk roam our Century Farm. Century Game Park sells bison meat by the front ¼, ½, hind ¼ or by individual cut. Yes, we sell Bison Skulls! We're Now at the Peterborough Farmers Market! Located in the drumlins leftover from the onslaught of glaciers at the beginning of the dawn of modern time, Robert Richard Potter chopped an existence out of the Canadian Wild in 1837, and called it home. Shelson, Clarence and Jack Potter toiled through the seasons of life to contribute to the agricultural community which they helped form. One hundred and fifty years passed, spanning five generations spent building and clearing the land in the Hills of Northumberland County. This scenic homestead, carved out of forests long after the retreating glaciers left their mark, soon became known as Century Game Park - named by the 5th generation, Rod Potter. Visitors can see first hand this splendid hump backed animal grazing as it did in prehistoric times, when it was hunted and worshiped by nomadic tribes of ancient ancestry. Although more compact then its primordial roots the mystique still prevails in the forceful character of these bearded bovines. Discover what makes Bison and Elk meat so unique. Low in fat and yet flavourful, with all the cuts you are familiar with. 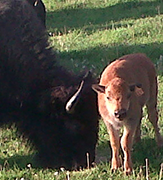 Bison is lower in fat and calories. Bison meat is a nutrient dense food because of the proportion of protein, fat, mineral, and fatty acids to its caloric value. 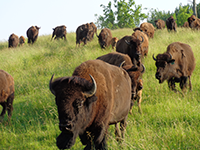 Compared to other meat sources, bison meat has a greater concentration of iron, zinc and essential fatty acids. Elk also offers a delicious, high protein, low fat dietary source of meat for the health conscious consumer desiring a well balanced diet.